September turned out to be a great month for equity investors: the MSCI All Countries ended the month 2.5% higher, despite all the political noise coming out of Spain, where Catalonia’s struggle for independence took a violent turn, and Germany, where chancellor Merkel did not receive a very strong mandate. For the first time in a while, developed markets managed to outperform their emerging counterparts. Navigator and Flexible both had a superb month, rising 4.04% and 3.37% respectively over the month, bringing their total year-to-date outperformance to 6.4% and 6.6% vis-à-vis their Morningstar categories. Both funds are beating around 95% of comparable funds since the start of this year. Recently we received a couple of questions about what exactly is driving these consistently strong results. So we performed a performance attribution excercise. The idea behind this technique is that a fund’s performance can be divided into two distinct components: asset allocation and stock selection. Where the first concept tells us whether a fund’s weight in a certain group of stocks (for instance overweighting the technology sector) added or detracted from its performance, the latter informs us on how successful a manager’s stock-specific bets have been. If you are not familiar with the concept, you can read more about it in one of our old blogposts. In that particular blog, we talked about a performance attribution that split up the alpha between allocation over sectors on the one hand, and stock selection within sectors on the other hand. Today we focus on another possible take at it: the splitting up of the alpha between allocation over regions on the one hand, and stock selection within regions on the other hand. We’ll go through the year-to-date results. In the graph above you can see how our active return (before transactions costs and other expenses) can be split up between our allocation over regions on the one hand, and the stocks we selected in each region on the other hand. 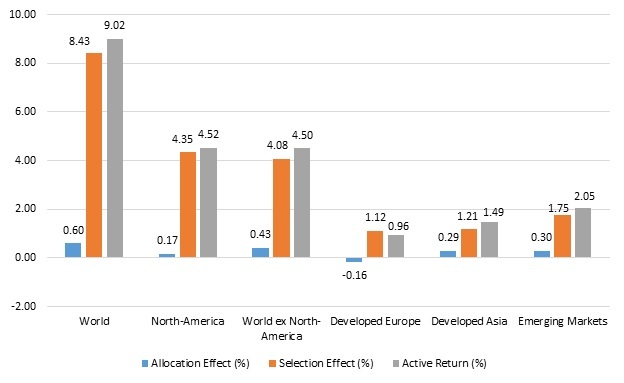 Picking the right stocks (= selection effect) contributed 8.43% to our alpha, explaining about 93% of total outperformance of 9.02%), while choosing the ‘right’ regions to invest in (= allocation effect) contributed merely 0.60% (explaining the remaining 7% of our active return). All-in-all this is what we had been expecting. Stock-picking is our niche and, while we enjoyed some outperformance by underweighting the USA and overweighting Emerging markets compared to the benchmark, regional weights are generally kept pretty much in line with the index, so this effect is bound to remain small. Second, the calculation shows that our stock-selection worked well in every major region we invested in. About 50% of our active return came from North-America (4.52%), which accounts for around 50% of the size of global equity markets (in terms of market capitalization). And by definition, the rest of the world did its fair share (making up the other 50% of the market, while producing 50% of our active return).